By Lisa Parry Arnold. Self‐published, 2014. 196 pages. $19.99/paperback; $9.99/eBook. As presented in the preface, this guidebook for Quaker family history research was inspired by the author’s passion for her own Quaker ancestry and encouraged by her personal academic studies and career with Ancestry​.com. Thee and Me’s structure is well conceived and the goals admirable. That said, this guide is not without some significant weaknesses and errors. Arnold is upfront about her motivations, and readers are advised to keep those in mind. The book focuses heavily on Philadelphia‐area Quakers, giving scant attention to the Quaker‐rich regions of Ohio and Indiana, which are barely included in the main chapters. The archives at Earlham College, which are significant, are not even mentioned in the resources chapter. This incomplete picture may lead readers to inaccurate assumptions. For example, it states that some meetings were laid down in the late nineteenth century due to declining membership among Orthodox Friends. But this statement does not acknowledge the dominance and growth of that branch of Quakerism in the South and Midwest. In a similar pattern, Thee and Me makes broad assertions about Quaker beliefs and practices that gloss over complexities and nuances that deserve more complete explanation. Arnold’s book is an improvement for individuals wanting a single book, as opposed to web links to a variety of sources, on how to do genealogical research through Quaker records. 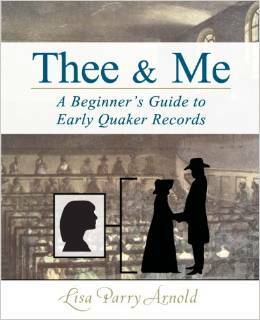 Thee and Me is an attractive and accessible initial guide most useful for researchers needing a print reference while using Ancestry​.com and focusing on areas shared in common with the book’s author.